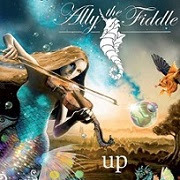 The pros and cons regarding the album "Up" by the German sextet Ally The Fiddle. It's Progressive Rock/Fusion. The overall structure which obviously include compositions, arrangements, and lengthy passages, definitely suits the classically trained violinist Ally "The Fiddle" Storch. You could say it's something out of the ordinary, even if the lead vocals are ever so monotone and clearly not quite as impressive as the virtuoso violin work. The likes of "Sisyphos", "Living In a Bubble", "Center Sun", does not compute, are really sore, and difficult to praise. The majority of tracks are instrumental and that's a blessing in the disguise or if you prefer skies. I'm not exactly having a go at The Fiddles, but they do play on the "posh" Prog-Rock card and aspect, that Prog being something that not everybody can play and thus why it should be enough to outplay the opposition. Unfortunately or fortunately? It's not always about skill or which level you've managed to reach on your musical journey to nirvana (pun intended - journey and nirvana. that's a double whammy). Most people tend to like material and structure where the melodies actually lead to something instead of merely stating the obvious - they we are darn good at playing our instruments. And make no mistake. These guys are d-a-r-n good musicians. There is just not a huge amount to rave about here if we're talking actual songs and melodies. In fact. The most memorable track, the cover of Surfing With The Alien. Alex Storch explains and I quote, "For me, being progressive means to spin around thoughts and to further develop music", end quote. Fair enough. I enjoy their 'thinking outside the box' agenda and no matter what, a good song is always a good song. These particular thoughts and tracks are simply not to my liking. Alex is no doubt a superb musician and that's something to keep in mind. I'm sure you'd enjoy catching them live on stage if only just to say 'hey, that's one helluva' violinist - shame about the songs though'. Guest musicians includes Marco Minnemann (The Aristocrats/The Mute Gods/Steven Wilson), Jen Majura (Evanescense), and Jerry Goodman (The Flock and Mahavishnu Orchestra).